Dover was founded as the court town for newly established Kent County in 1683 by William Penn, the proprietor of the territory generally known as the " Lower Counties on the Delaware." 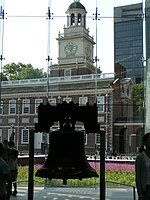 Later, in 1717, the city was officially laid out by a special commission of the Delaware General Assembly. The capital of the state of Delaware was moved here from New Castle in 1777 because of its central location and relative safety from British raiders on the Delaware River. Because of an act passed in October 1779, the assembly elected to meet at any place in the state they saw fit, meeting successively in Wilmington, Lewes, Dover, New Castle, and Lewes again, until it finally settled down permanently in Dover in October 1781. The city's central square, known as The Green, was the location of many rallies, troop reviews, and other patriotic events. 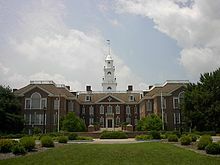 To this day, The Green remains the heart of Dover's historic district and is the location of the Delaware Supreme Court and the Kent County Courthouse. Dover was most famously the home of Caesar Rodney, the popular wartime leader of Delaware during the American Revolution. He is known to have been buried outside Dover, but the precise location of his grave is unknown. A cenotaph in his honor is erected in the cemetery of the Christ Episcopal Church  near The Green in Dover. 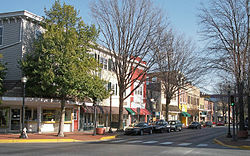 Dover has a warm temperate climate or humid subtropical climate ( Köppen Cfa). Summers are hot and humid, with 23 days per year reaching or surpassing 90 °F (32 °C). Brief, but heavy summer thunderstorms are common. Winters are moderated by the Delaware Bay and the partial shielding of the Appalachians, though there are normally 8−9 days when the daily high remains below freezing and 15 nights with lows below 20 °F (−7 °C). Snow is typically light and sporadic, averaging only 15.7 inches (40 cm) per season, and does not usually remain on the ground for long. Spring and autumn provide transitions of reasonable length and are similar, though spring is more wet. The monthly mean temperature ranges from 35.2 °F (1.8 °C) in January to 77.7 °F (25.4 °C) in July. The annual total precipitation of around 46 inches (1,170 mm) is spread rather evenly year-round. Dover averages 2300 hours of sunshine annually. In 2010,  Dover had a population of 36,047 people. The racial makeup of the city was 48.3% White, 42.2% African American, 0.5% Native American, 2.7% Asian, 0.1% Pacific Islander, 2.1% from other races, and 4.1% from two or more races. 6.6% of the population were Hispanic or Latino of any race. As of the census  of 2000, there were 32,135 people, 12,340 households, and 7,502 families residing in the city. The population density was 1,435.0 people per square mile (554.1/km²). There were 13,195 housing units at an average density of 589.2 per square mile (227.5/km²). The racial makeup of the city was 54.94% White, 37.22% African American, 0.45% Native American, 3.16% Asian, 0.04% Pacific Islander, 1.57% from other races, and 2.62% from two or more races. 4.13% of the population were Hispanic or Latino of any race. The Dover Police Department provides police services to the city of Dover. The police department is led by a Chief of Police, currently Marvin C. Mailey, and consists of 101 officers, responding to 43,000 calls a year. The Dover Police Department is composed of several sworn police units along with civilian units. Fire protection in Dover is provided by the Dover Fire Department, a volunteer fire department which has served the city since 1882 and operates two stations in Dover. Station 1 is the department's headquarters and houses Engines 4, 6, and 7; Ladder 2; Rescue 1; Brush 9; and Marine 1. The Dover Fire Department Museum is also located at the headquarters. Station 2 houses Engines 2 and 3; Ladder 1; Utility 1; and the foam trailer. Dover is the only state capital in the United States with a volunteer fire department. Two weekends a year, NASCAR races are held at Dover International Speedway, attracting about 65,000 spectators. 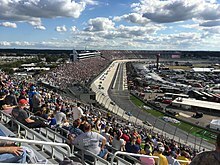 Attendance to the races is much lower than in the 1990s and 2000s, when 140,000 spectators came to Dover International Speedway and led to traffic snarls throughout the city and on US 13 approaching Dover. The races bring in increased patronage for local businesses, and hotels and motels sell out weeks in advance. Many race fans camp in RVs and tents adjacent to the track. These races, and in recent years adjacent slot machine gambling at Dover Downs Hotel & Casino, contribute millions of dollars to Dover's economy. 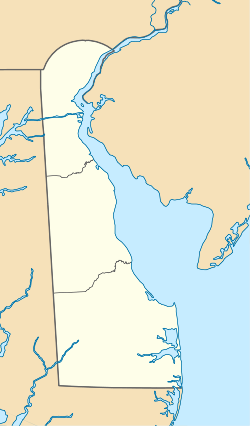 Dover is located on a former Pennsylvania Railroad line, later operated by Penn Central, Conrail, and Norfolk Southern and now operated by the Delmarva Central Railroad as its Delmarva Subdivision. At one time Dover had daily passenger service until the Pennsylvania Railroad's Blue Diamond was discontinued on December 31, 1965. In later years, Dover was served by special Amtrak trains to NASCAR races at Dover International Speedway and the Delaware State Fair in Harrington. Today, the rail line now is just used for local freight. The closest passenger rail station is the Wilmington station in Wilmington, served by Amtrak's Northeast Corridor and SEPTA Regional Rail's Wilmington/Newark Line. Three public school districts serve Dover residents. The majority of the city is served by the Capital School District, which includes Dover High School. The southern portion of Dover is served by the Caesar Rodney School District, which includes Caesar Rodney High School located just outside the city in Camden. The Polytech School District, which includes Polytech High School located in Woodside, serves as an overlay district for vocational-technical students. Dover is also home to The Children's Theatre, Inc. of Dover and Kent County,  a non-profit organization. In Dover's historical district is the Sewell C. Biggs Museum of American Art,  featuring collections from the Colonial days to the present. Kent County is within the Philadelphia television market, with the local Xfinity cable system carrying most channels from that city, alongside Salisbury stations WBOC-TV 16 ( CBS), WMDT 47 ( ABC) and WCPB 28 ( PBS), plus low-powered Rehoboth Beach NBC affiliate WRDE-LD 31. WBOC-TV maintains a bureau in Dover, and WHYY-TV 12, the PBS member station in Philadelphia, maintains a studio and broadcasting facility in Dover. WMDT operates a local repeater serving Dover, WEVD-LP channel 27, while WHYY programming is seen locally on WDPB-TV channel 64 from Seaford (part of the Salisbury television market). WDDE,  Delaware's first NPR station, launched in August 2012. It broadcasts on 91.1 FM. 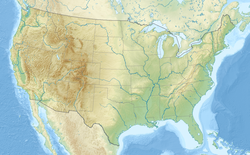 Delaware was the last state in the nation to have an NPR station located within its borders. For one week during the middle of July every year, Dover also hosts the Big League ( Little League 16-18) Eastern Regionals, attracting teams from all of New England and the Mid-Atlantic. There are several golf courses located near Dover. They include the Maple Dale Country Club  in Dover, Wild Quail Country Club  near Camden, Jonathan's Landing Golf Course  near Magnolia, Dover Center Par 3 and Driving Range in Dover, and the Eagle Creek Golf Course (Must have military I.D.) on the Dover Air Force Base.